" Clint Curtis Files Congressional Challenge to Election of U.S. House Opponent Tom Feeney	"
We hinted at this last week when Florida's corrupt Rep. Tom Feeney (R-Abramoff) expressed his obnoxious indignation over the democratic (small "d") Congressional election challenge filed by Christine Jennings (D) against Vern Buchanan (R) in the FL-13 U.S. House race. This is the contest in which the perpetually election-challenged state of Florida certified Buchanan as the winner by 369 votes, even though some 18,000 votes seem to have disappeared altogether on Sarasota County's paperless ES&S touch-screen voting machines. The challenge brought Feeney slithering out from under his rock to charge that Jennings' Constitutional request that Congress not seat Buchanan --- who appears to have "won" only due to failures in Sarasota's voting equipment (which even ES&S's own "expert witness" admitted on the witness stand during a hearing on the election contests filed by both Jennings and voters in Florida) --- amounted to "total political dictatorship." At least that's what Feeney told the Orlando Sentinel at the time. What he doesn't seem to have told them is that he too is the object of a similar Constitutional challenge in Congress by his own opponent, Clint Curtis, in the race for U.S. House in Florida's 24th district. Curtis, who originally exposed Feeney's alleged attempt to create touch-screen vote-rigging software back in 2000 (a story broken by The BRAD BLOG in 2004 and followed in detail ever since), campaigned to unseat Feeney this year for the first time, but was declared the loser. Curtis disagrees. Warren Stewart at VoteTrustUSA covered both the Curtis and Jennings challenges on the Thursday before XMas weekend, along with a posting of the complaints filed by both candidates (Curtis' complaint here, Jennings's complaint here, both in WORD format) as filed in Congress. We've yet to review either complaint or discuss them with either candidate personally, so we'll refer to Stewart's coverage and the actual complaints for the moment and let you people do some work for a change. Curtis down, but he's not out --- right? Clint Curtis, who challenged Rep. Tom Feeney, R-Oviedo, in the general election, lost by nearly 28,000 votes. Or did he? Curtis, a Democrat whose campaign centered on questioning the integrity of the nation's vote-counting system, has filed formal notice of an election challenge with the U.S. House of Representatives. Among the charges is that official voting results are "wrong, unreliable and not worthy of any election in this country." Why? Mishandling of election laws, malfunctioning voting machines and --- wait for it --- the likelihood that affidavits furnished by Curtis from voters who say they voted for him will add up to more than the totals reflected in the official record. « PREVIOUS STORY "U.S. Military Death Toll in Iraq Exceeds 9/11 Count"
"Clint Curtis Files Congressional Challenge to Election of U.S. House Opponent Tom Feeney"
Fla. needs a revote on paper. If Pelosi refuses to seat Buchanan and does seat Feeny. That will say a lot about where the dems. stand on election fraud. Coleen Rowley wasn't helped by the DNC in her senate bid.Move along. Everything is fine. Don't make waves. Sorry ..got that backwards. Refuses to seat Buchanan and doesn't address Feeny's dubious win. America needs to take a chimichanga from Mexico's election cafeteria . . .
Tom Feeney's another crook "on the take" within the GOP and will experience the same fate as his comerade-in-crime, Bob Ney. I can't wait to see Feeney get his "just desserts" for a lifetime of manipulation, chicanery, deceit and fraud. Atta boy, Clint. 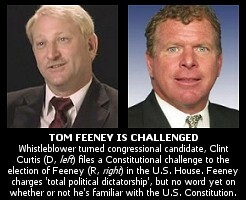 Go afer Feeney's jugular - see if he has any human blood surging through those veins...I highly doubt it! And, I'd bet megabucks on the fact that the same "fix" that was in on the Jennings/Buchanan race was in on the Feeney race? What does anyone want to bet? Florida is full of corruption. Just look at the "stolen election of 2000" but, of course, big bro Jebbie couldn't have a second stolen election again in 2000 so they made certain to have Diebold, ES & S and Sequoia do their bidding for them in Ohio....do these crooks really think that americans respect them? Do they really believe that have the people fooled? Absolutely not! Just let Jebbie make a run for political office and you'll see just how complicit this guy has been in all of this....the "whistleblowers" will be crawling out of the palm trees in Florida like the "packrats"...hahah! If the affidavits of Clint voters add up to more than the "final machine count", is that a huge blockbuster? Or what??? Then, Clint's a genius for even THINKING of doing that! Also, that means candidates have to run their OWN parallel elections...isn't that pretty sad??? If Clint's affidavit votes are greater than the "final machine count" votes, that really means we are no better than some 3rd world country with sham elections. And America's democracy is a big joke. AND...it would beg the question, what did our soldiers die for in the Iraq War...AND, would we have even HAD that war, if it weren't for e-vote machines??? The ramifications of Clint's affidavits cannot be underestimated. Expect the CMSM NOT to follow the story...I don't mean a couple of newspapers, I mean the amount of coverage will NOT be in proportion to the importance of the story. The state of Florida is clearly ingnoring its constitutional responsibility to run clean and auditable election. The House of Representitives can and must investigate and if necessary block HIGHLY QUESTONALBLE candidates from taking their seats. If the House fails to act, then the US is on the path to a "Government Run By 50 Banana Republics". Far from everyone who voted for Clint is likely to be willing to sign an affidavit. If Clint got more signatures than votes despite that fact, then it is clear that the reported vote count could not even have been close to correct. Faith based voting is clearly only for Banana Republics! We need to dump faith based voting ASAP! So much rhetoric so little proof. Does Clint have a job? Meanwhile, Feeney is ducking and dodging and refusing to answer these allegations with anything even remotely resembling a straight answer. The scales of integrity, in this case my dear troll, fall squarely with Clint Curtis. Where, pray tell, does your integrity lie? Actually, Curtis has said so for a long time. But more of note, so has Citizens for Responsibility and Ethics in Washington (CREW), who ranked Feeney among the Top Most Corrupt Congress Members for the second year running. Details here. They are the same people who defended the Iraq War, and now avoid the subject. It's all the same thing. Bash the truth and people fighting corruption...until it's proven beyond a doubt they are wrong...and then go into hiding. So, I guess with the Clint affidavit thing, we're at the "bash the people fighting corruption" phase, and soon when Clint is proven right...AGAIN...said bashers will go into hiding. Remember all the people who bashed us, when we first said e-voting was a fraud? Remember all the Bush-backers for the Iraq War? will generate a much differnt result.This has worked well in 2nd and 3rd world counties,sad... that it has to be done in this way to insure fair results in disputed American elections here at home ! Holy cow, Clint got all those affidavits! I'm IMPRESSED. What a bulldog! Also, Clint's website says BOTH elections (his and Jenning vs. Buchanan) are also being challenged in State Circuit court in Tallahassee. Clint's great idea should be a model for all elections held on voting machines. This is BIG and just what I had hoped for. The fact that all those people signed affidavits shows their absolute devotion to Clint's cause. Amazing! How do we know this is big news? The media will not cover it! Clint says so but that is beside the point. If Clint has the signatures of more registered voters voting for him than were credited with doing so then we clearly don’t need to decide if we can trust Clint or not. We have to decide if in a “democracy” we should trust the word of the voters or the word of those who claim to be “counting” our votes. It has to be one or the other. Clint has made it perfectly clear that we can not trust both. Those who really believe in democracy clearly have to go with the word of the voters. Those who only claim to support democracy will go with the word of the proven crooks (Thank you Clint!!!) who claim to be “counting” our votes! If the signatures on the affidavit match those of the registered voters then “so little proof” is all the proof any logical mind should require to reach the correct conclusion! That’s plenty good enough for me. Is it good enough for you? That question does not even logically fit into the big picture so among those of us who think logically there clearly is no need for any answer to your worthless question! Unfortunately, after an anonymous vote in the hands of an elections apparatus that is unresponsive to your goals, your only recourse is to have a published vote that is in excess of what they show you to have gotten. The short story is: anonymous vorting doesn't cut it, if you're to have any confidence in it, through all possible eventualities. As in... you would give the current administration even more control over the voters than they already exercise with disenfranchising laws, gerrymandering, and the ever-popular e-voting. I was surprised at how easy it was to get affidavits from people. In the two Saturdays I spent out collecting them, I can only recall two people who refused to sign one. Most people were really receptive, and thanked me for the important work I was doing. The real problem is catching people at home... The work is ongoing, and I'm certain it will bear fruit. The proof is already outlined in Clint's filing, but as more time passes, and more affidavits are collected, Clint's case for a re-vote can only become stronger. Everyone can help by contacting Nancy Pelosi and urging her to oppose the swearing in of Buchanan and Feeney! And I'm glad about that, and hope it works for the intended purpose... and will not be surprised if it does. If you voted for Clint Curtis you should consider filling out an affidavit if asked to. The danger I speak of would lie in people seeing this as something other than what it really is: an emergency response to an election system that is badly broken. ...and I don't mean the Bush variety of "perpetual emergency measure". CURTIS WINS PARALLEL UNIVERSE VOTE!!!!! But Feeney gains win in terrestrial balloting. Curtis pledges "forensic reconstruction" of vote. No word on Curtis sanity test results. Maybe we should put hoods over our heads when we vote. I mean really, if we are the home of the brave, we shouldn't give a hoot who knows what we're casting our vote for, and that includes your employer. It's the principal of the thing that counts. I've become very weary of the whole concept of secret voting, and nobody can deny that the HAVA act wrecked our system specifically because of that concept. It doesn't work. If you're not proud of who you're voting for, or are afraid to tell your employer who you're voting for because you think he might disapprove, you're practically unamerican. "Maybe we should put hoods over our heads when we vote. I mean really, if we are the home of the brave, we shouldn't give a hoot who knows what we're casting our vote for, and that includes your employer. It's the principal of the thing that counts." BTW, editor, please don't edit my posts, even for cosmetic reasons, without a notice that they've been edited and why... the reasoning should be self-evident. Conservatives should back off the sarcasm... period. Conservatives understand sarcasm... it's irony they have trouble comprehending. Neither Liberals or Conservatives should be allowed to run loose as they will surely come to harm. Conservatives, including Libertarians, only understand their own benefit, and can't even fathom that their own annihilation lurks behind this very thing. Sarcasm doesn't work on the internet because the voice inflection needs to be there for it to be understood. That's why I always tell people when I'm being sarcastic here. I believe every word I typed in my post about secret voting and never hesitated to tell my boss and regional manager where I stood, despite the fact they were 180 degrees in opposition to my stance. In fact, I think they would probably tell you I shoved it down their throats. I think they admired my commitment and I admired them for not firing me. I hope this doesn't hurt your feelings Kitty, but sometimes I can't tell where you're coming from. I hate it when that happens.